This 2-year programme contains 120 ECTS credit units and leads to the joint diploma of International Master of Science in Soils & Global Change. 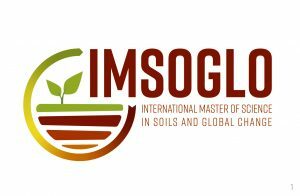 The IMSOGLO master programme is coordinated by the International Training Centre of the Faculty of Bioscience Engineering at Ghent University. This progamme has two specialization options of 90 ECTS, to be chosen after the 1st semester (30 ECTS). Specialization “Soil biogeochemistry and global change” is organized by Ghent University, the University of Natural Resources and Life Sciences Vienna and the University of Göttingen and leads to a joint MSc-diploma issued by these 3 universities. Specialization “Physical land resources and global change” is organized by Ghent University and Aarhus University, and leads to a joint MSc-diploma issued by these 2 universities. The full programme with courses can be seen below.